Water is the oldest but most effective fire suppression agent. Water still is protecting its effecience and importance on suppression due to its cooling and evaporation effect. Conventional suppression systems use big water drops on small suppression area and water consumption is very high. The goods inside the effected area can be damaged because of usage plenty of water. AKRONEX hybrid system uses water as natural agent and represent AKRONEX’s scope expertise of extinguishing. AKRONEX also supports risk assessment, system design, installation and operation and support. The Hybrid Fire Protection System extinguishes open spaces and growing fires effectively and quickly at low hydraulic pressure. Unique two-phase flow technology separates the water and gas mixture into fine (atomized size) water droplets. Hybrid system can be applied for the protection of rooms and objects. The Hybrid system has become an effective extinguishing system by optimizing the physical properties of the water through the system. In Hybrid system applications, pressurized water and gas mixture with 85-100 bar is pulverized with special nozzles and discharged at high speed. 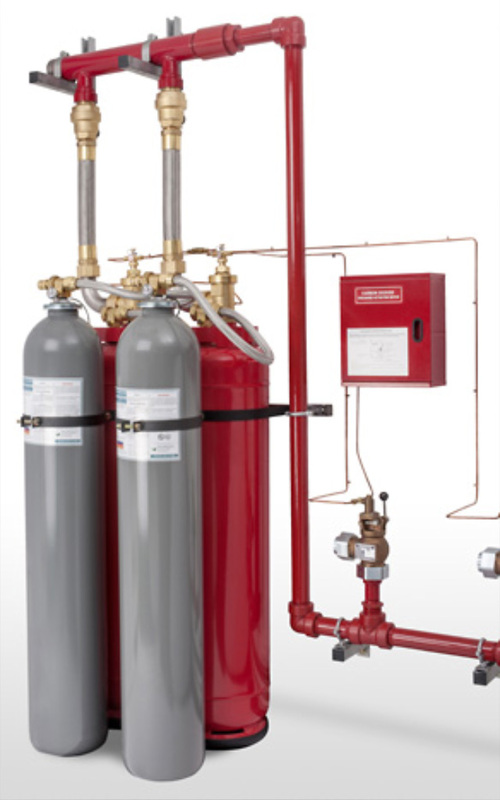 Hybrid system use a similar system with conventional fire extinguishing systems. But this time the water droplets (less than 10 microns) are 100 times smaller than 1 water drop. Hybrid system uses less water than the conventional system and emits 50% more emissions and completely extinguishes. Unlike other systems, AKRONEX hybrid suppression system utilizes both water and nitrogen at best level. Water and nitrogen complement each other at perfect level and extinguish fire. For small fires, nitrogen is the main fire-fighting agent. The Hybrid system reduces the oxygen in the area to the breathable level. The homogeneous mixture of water droplets and nitrogen gas is propelled with enough energy to overcome the drag effect that has limited the effectiveness of traditional water mist systems. 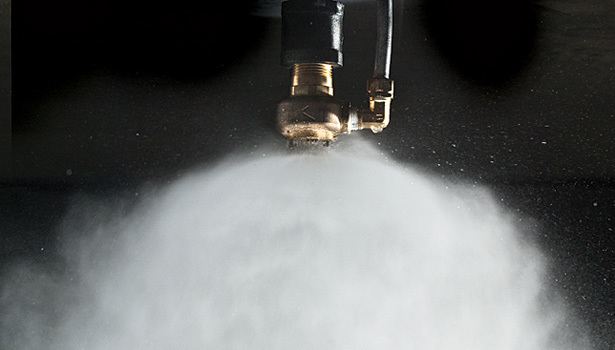 The effectiveness of a hybrid system in fire suppression depends on its spray characteristics, which include the droplet size distribution, flux density and spray dynamics, with respect to the fire scenario, such as the shielding of the fuel, fire size and ventilation conditions. AKRONEX hybrid system extinguish fire actively without harm people. Today, AKRONEX protects people, property and business continuity in a wide range of applications both on land and at sea.